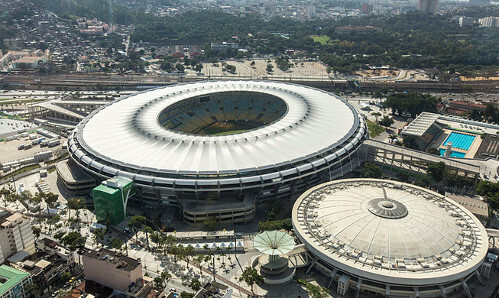 The final of the 2014 World Cup will be held in the iconic Maracana stadium in Rio De Janeiro but this fantastic ground forms just part of 12 venues that are being used throughout the tournament. The Brazilian authorities have worked hard to produce new stadia and introduce new facilities and this is what they’ve come up with for 2014. In total, the Maracana will host seven games in this year’s world cup starting with the opening match in Group F between Argentina and Bosnia. The remaining group ties here are Spain v Chile, Belgium v Russia and Ecuador v France. This famous ground will also play a big part in the knockout stage and will host a round of 16 tie, a quarter final and, of course, the final itself on 13th July. The Arena de Sao Paulo is home to Corinthians football club and this will also be a busy venue in 2014. The stadium has the honour of hosting the opening game between Brazil and Croatia together with three further group ties which are, Uruguay v England, Netherlands v Chile and South Korea v Belgium. The arena is also involved in the knockouts and will host one round of 16 game and one semi final. The Estadio Mineirão in Belo Horizonte is another busy venue at this summer’s World Cup. Four group ties are scheduled here starting with Colombia v Greece in Group C while English fans will be looking out for their side’s tie with Costa Rica on June 24th. Mineirão has been named as the second semi final host and once again there will be a round of 16 match taking place here. Along with the Maracana, the national stadium of Brasilia is the busiest location at this year’s tournament. Seven matches will be played here including four group ties, the highlight of which is likely to be Portugal v Ghana. After that phase, a round of 16 game and a quarter final will be held before the third place play off takes place here on the 12th of July. Meanwhile, the Arena Fonte Nova in Salvador has a similar schedule but it will showcase three crucial group games. Spain v Netherlands, Germany v Portugal and Switzerland v France will all be played here. Two further stadiums have also been set aside to hold round of 16 matches. The Estadia Beira-Rio in Porto Alegre also has four group ties to look forward to including Nigeria v Argentina. In addition, the Arena Pernambuco in Recife will host four group fixtures and a match in the first knockout phase. In addition to those stadiums that will feature in the knockouts, the World Cup in Brazil also has four grounds hosting games in the groups. These are located in Curitiba, Natal, Manaus and Cuiaba. There has been much criticism of the work involved and along the way there have been a number of concerns expressed about the speed of the project. However, it does appear that building work is complete, even if things have been taken down to the wire! One thing is certain, these grounds will hold some passionate football fans and the atmosphere at Brazil 2014 is going to be truly unforgettable. Predictions for Sunday, 29th: Can the Dutch march on?